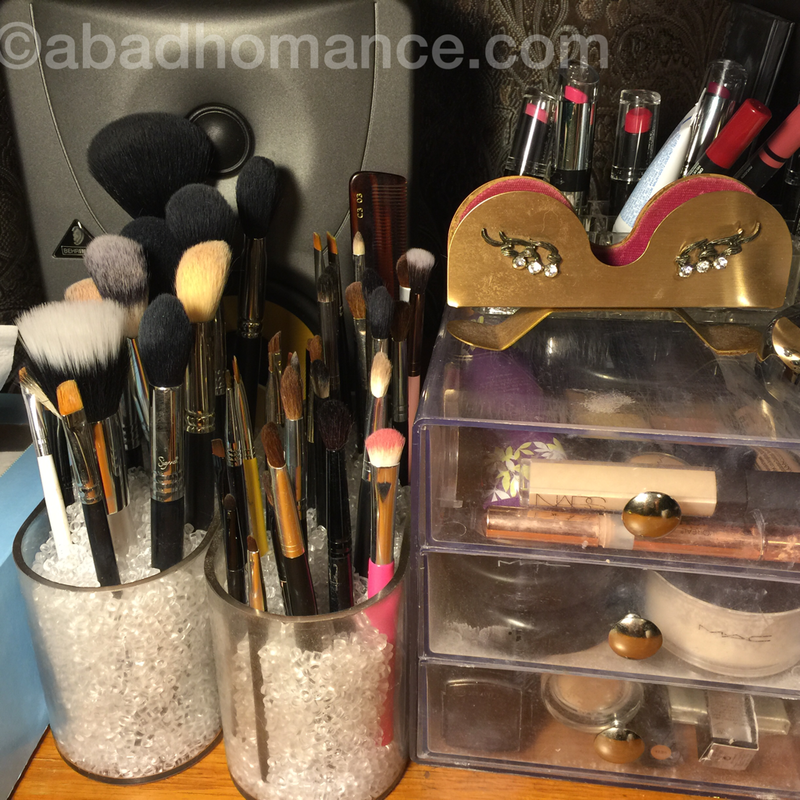 It’s Sunday – time to organize and clean! So, if I can get to it, I usually wash my brushes on Sunday (unless I haven’t used them much). This weekend I’ve been cleaning a lot and today I rearranged my new makeup desk setup (I recently moved EVERYTHING across the room because I decided standing up is for the birds). I’m sure I will keep moving it around because I cannot seem to get good lighting even with 2 lamps and a lighted mirror. Well…I got the cheap one…not the $200 one…ah, that’s a post for another day. That’s an obscene number of brushes. Some aren’t even shown here. I take really great care of them, though, and most of my MAC brushes are about 13-14 years old – no lie!! If you invest in quality brushes and care for them properly, it’s a worthwhile investment. That’s not to say there aren’t some cheap gems out there – see that $1 ELF concealer brush? I spot conceal with it nearly every day. There are some Sonia Kashuk and Eco Tools brushes in there, too, along with the MAC and Sigma. You might even spot one or two detail brushes from the art store! What brushes are your favorite? Any special tips for how you store them? This entry was posted in beauty blog, beauty blogger, Behind the Scenes, General, makeup brushes and tagged bdellium tools, beauty blog, beauty blogger, ELF brushes, mac brushes, makeup, makeup brush holder, makeup brush storage, makeup brushes, sigma beushes, sonua kashuk brushes by Rachel. Bookmark the permalink. Your brushes all look so nice!! I’ve been so used to, over the years, sticking to maybe 3-4 brushes. But the more I buy, especially the better quality I buy, I find that it makes such a huge difference. Who knew! It’s this weird vase filler stuff that looks like little glass beads, but you can use rice, beads, lots of things, or just in a wide/short vase – lots of good ideas on Pinterest!